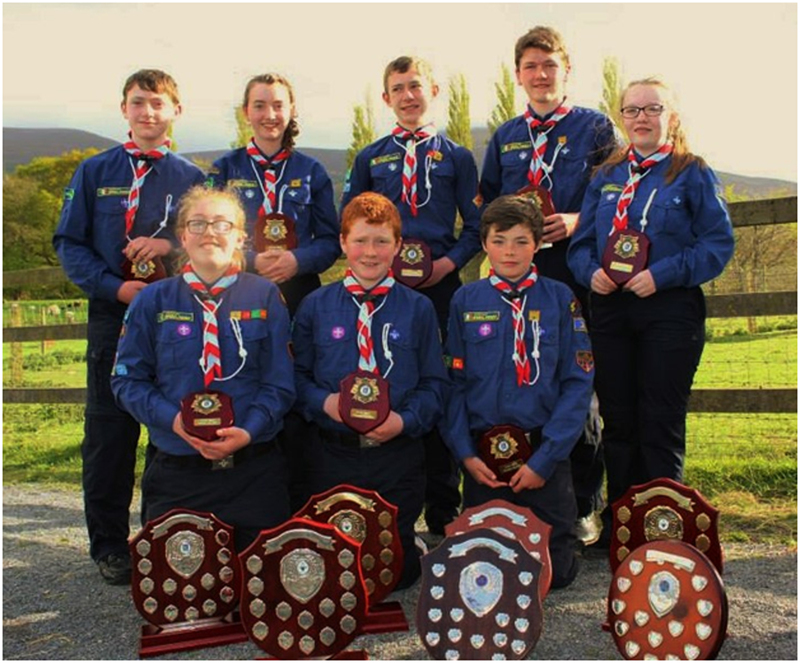 Cahir Scouts have had a very busy May & June and are ready for a busy July & August training and participating in the Scouts All Ireland Campcraft Competition "The Phoenix Challenge"
After taking home Seven first place trophies from the County Shield Competition on the weekend of May 1st, 2nd & 3rd held in Parson's Green, Clogheen our Fox Patrol of eight scouts are now heading for Palliskennry, Co Limerick on the weekend of 20th - 23rd August. The Fox Patrol of the 7th Tipperary was lead by Patrol Leader Conor O'Brien, Assistant Patrol Leader Norma Kennedy, Cook Laura Hubbard, Scribe Shauna O'Dwyer, First Aider Mark Casey, Navigator Kevin O'Connor, Quartermaster Michael Reidy and Fire Officer Dylan Houlihan. The trophies brought home were Nature, Cooking, General Knowledge, Lofty Shield, Uniform, and Campcraft & Log Book. Thanks to Scout Leaders Tara Armitage, Brian Hickey, Eoghan (Clive) O'Donnell and Jonathan Mcloughlin and Venture Scout Brian O'Connor. The trophies and photos are on display in the Library window for all to see. On Saturday 13th June, 19 members of the scout troop enjoyed a hike to Lake Muskry in the Galty Mountains. The scouts departed Rossadrehid village in the Glen of Aherlow on Saturday afternoon and navigated their way through the woods and out onto the open mountains to hike to the lake. Lake Muskry nestled beneath Greenane and lies at an altitude of 491 meters. While the sausages were cooking some of the brave scouts took a swim in what must have been a pretty cold mountain lake. June 17th - 21st the scout troop were on summer camp with three leaders and 18 Scouts, the troop enjoyed a fabulous few days in the sundrenched South East, camping behind the Coastguard station in Bun Mahon. The scouts enjoyed a surfing lesson, crab fishing, a talk on the Copper Mines, Swimming and games. After a BBQ on Saturday night investiture and presentations were made and the camp welcomed the Cois tSuiire County Commissioner Mr Michael Dempsey and family. There were two scouts invested and what better place to do it than on camp, congratulations to Thomas Fox and Cody Downey who were invested by the County Commissioner . Michael also presented The Chief Scout's Commendation Award to Brian Hickey and John Hickey for service to the scout troop and committee. as well as a good camping cert to the troop and a specially designed badge "camp 2015 badge" for each member. Scout of the year was jointly won by Laura Hubbard & Dylan Houlihan and the Billy Coffey cup was presented by the County Commissioner.